Ivor Norman Richard Davies CMG FBA FRHistS (born 8 June 1939) is a British-Polish historian noted for his publications on the history of Europe, Poland and the United Kingdom. He is a historian with special interest in Central and Eastern Europe. He is UNESCO Professor at the Jagiellonian University, professor emeritus at University College London, a visiting professor at the Collège d'Europe, and an honorary fellow at St Antony's College, Oxford. He was granted Polish citizenship in 2014. Davies intended to study for a PhD in the Soviet Union but was denied an entry visa, so instead he went to Kraków, Poland, to study at the Jagiellonian University and did research on the Polish–Soviet War. As this war was denied in the official communist Polish historiography of that time, he was obliged to change the title of his dissertation to The British Foreign Policy towards Poland, 1919–20. After he obtained his PhD in Kraków in 1968, the English text was published in 1972 under the title White Eagle, Red Star. The Polish–Soviet War 1919–20. From 1971, Davies taught Polish history at the School of Slavonic and East European Studies of University College London, where he was professor from 1985 to 1996, when he retired. He subsequently became Supernumerary Fellow at Wolfson College, Oxford, from 1997 to 2006. Throughout his career, Davies has lectured in many countries, including the United States, Canada, Australia, Japan, China, Poland and in most of the rest of Europe as well. Stanford University's history department denied Davies a tenured faculty position in 1986 (on an 11 against, 10 for and 1 abstaining, vote). The decision was described as "the closest, most acrimonious tenure decision of recent years". After failing to arrange a formal review hearing of the decision, Davies filed a lawsuit against History Professor Harold Kahn and 29 other Stanford professors. This case was dismissed when Davies was unable to depose Kahn. Davies subsequently sought to obtain $3 million in damages from the university, arguing he had been the victim of discrimination on the grounds of his political views (with the claim being "defamation," "breach of contract" and "tortious interference" with a business). The court ruled that because of California's right of privacy "even if we assume that... a candidate may be denied tenure for improper" [e.g., defamatory] "reasons, we are of the opinion that the right of a faculty member to discuss with his colleagues the candidate's qualifications thoroughly and candidly, in confidence and without fear of compelled disclosure, is of such paramount value that it ought not to be impaired." The court upheld the university's right to decide on faculty appointments on the basis of any criteria. Davies is a visiting professor at the Collège d'Europe. In 2002, at the suggestion of the city's mayor, Bogdan Zdrojewski, Davies and his former research assistant, Roger Moorhouse, co-wrote a history of Wrocław / Breslau, a Silesian city. Titled Microcosm: Portrait of a Central European City, the book was published simultaneously in English, Polish and German, and later appeared in Czech, French and Italian. Davies' book Rising '44. The Battle for Warsaw describes the Warsaw Uprising. It was followed by Europe at War 1939–1945: No Simple Victory (2006). In 2008 Davies participated in the documentary film The Soviet Story. Historians Lucy Dawidowicz and Abraham Brumberg object to Davies' historical treatment of the Holocaust in Nazi-occupied Poland. They accuse him of minimising historic antisemitism, and of promoting an idea that academic views of the Holocaust in international historiography largely overlook the suffering of non-Jewish Poles. Davies's supporters contend that he does give due attention to the genocide and war crimes perpetrated by both Hitler and Stalin on Polish Jews and Poles. Davies himself argues that "Holocaust scholars need have no fears that rational comparisons might threaten that uniqueness. Quite the opposite." and that "... one needs to re-construct mentally the fuller picture in order to comprehend the true enormity of Poland's wartime cataclysm, and then to say with absolute conviction 'Never Again'." Davies' "manner and substance of academic interpretation" of the Holocaust was cited as a factor in a controversy at Stanford University in which Davies was denied a tenured faculty position for "scientific flaws". Edward Bernard Raczyński, President of the Polish government-in-exile, decorated Davies with the Order of Polonia Restituta. On 22 December 1998 President of Poland Aleksander Kwaśniewski awarded him the Grand Cross (1st class) of the Order of Merit of the Republic of Poland. Finally, on 11 November 2012, Davies was decorated with the Order of the White Eagle, Poland's highest civilian award. Davies has been appointed to the Advisory Board of the European Association of History Educators—EUROCLIO. In 2008, he was awarded the Order of the Cross of St Mary's Land 3rd Class by the Republic of Estonia. Davies also received Knight of Freedom Award in 2006 for his promotion of Polish history and the values represented by General Casimir Pulaski. Davies married Maria Korzeniewicz, a Polish scholar born in Dąbrowa Tarnowska. Norman Davies lives in Oxford and Kraków, and has two sons. His uncle Donny died in the Munich air disaster. 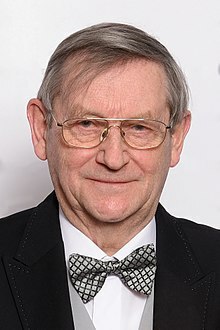 ^ "UK historian Norman Davies granted Polish citizenship". Polskie Radio dla Zagranicy. ^ "We must not forget the real causes of the war". The Independent. 28 August 2009. ^ Applebaum, Anne (May 1997). "Against the old clichés – Review of Europe: A History by Norman Davies". The New Criterion. New York. Retrieved 2 August 2008. ^ a b "Davies case exposes tenure process to public scrutiny"
^ a b "State appellate court upholds Stanford in Davies case". Stanford University News Service. Stanford University. 5 September 1991. Retrieved 3 August 2008. Davies's works have been criticized at Stanford and elsewhere, by such experts as Lucy S. Dawidowicz (author of The War Against the Jews: 1933–1945) who said they felt Davies minimized historic anti-Semitism in Poland and tended to blame Polish Jews for their fate in the Holocaust. Davies' supporters contend that Poles suffered as much as Jews did in the war and could have done very little to save any of the 3 million Jews living in Poland at the time of the Nazi invasion in 1939. Davies had sought $3 million in damages from the university for what he called fraud, misrepresentation, breach of contract, discrimination and defamation. ^ "Kahn v. Superior Court (Davies) (1987)". Retrieved 27 April 2018. ^ "The Soviet Story". Archived from the original on 18 January 2016. Retrieved 3 August 2008. ^ Lucy Dawidowicz, "The Curious Case of Marek Edelman". Observations. Commentary, March 1987, pp. 66–69. See also reply by Norman Davies and others in Letters from Readers, Commentary, August 1987 pp. 2–12. ^ Abraham Brumberg, "Murder Most Foul", Times Literary Supplement, 2 March 2001. Essay on Neighbors by Jan T. Gross. Tony Judt and Abraham Brumberg. Letters, Times Literary Supplement, London 6 April 2001. See also response by Norman Davies, Letters, Times Literary Supplement, London 13 April 2001. ^ Norman Davies, "Russia, the missing link in Britain's VE Day mythology", The Times, London, 1 May 2005. ^ Norman Davies, lecture, University of Cincinnati Department of History and the Center for Holocaust and Humanity Education, Cincinnati, OH. 26 April 2005. ^ "Gesamtliste der Mitglieder". European Academy of Sciences and Arts, Salzburg. Archived from the original on 10 October 2007. Retrieved 3 August 2008. ^ "Fellows of the Royal Historical Society, D – F". Archived from the original (MSWord) on 19 December 2008. Retrieved 3 August 2008. ^ a b "Poland honours historian Norman Davies". Polskie Radio dla Zagranicy. ^ United Kingdom 2001 New Year Honours List: "No. 56070". The London Gazette (Supplement). 30 December 2000. pp. 3–3. ^ Davies, Norman, Biography . ^ "Norman Davies: "Podejrzewaliśmy Niemców"" (in Polish). Wawrzyn Info. February 6, 2015. ^ "Beneath Another Sky, A Global Journey into History by Norman Davies". www.penguin.co.uk. Retrieved 27 April 2018.